Works on the hereditary or merit-based aristocracy of Malta are not lacking, however, Giovanni Bonello says Charles A. Gauci’s book The Peerage and Knightage in Malta is “different”. “It has more density and more intensity. The author is admirably thorough and systematic. He builds the results on solid evidence, when available, so that few would care to challenge his conclusions,” Dr Bonello writes in the book’s preface. He describes the book as “a truly encyclopaedic work on the origins, workings and relevance of all the noble families who have left their mark”. Twenty-five years after his last work on the Maltese nobility, Dr Gauci came up with this 700-odd page work that is divided into three sections dealing with peerage, knightage and the honours system. The honours included in the book span from the latest granted in 2018 to the earliest in 1350. The publication includes a list of Maltese recipients of Maltese honours and awards together with the date of conferment. Relying on information published in The Malta Government Gazette, the author names authorised recipients of foreign honours, though she notes that no names had been published between 1974 and 1987. Authorised honours, as published by the Department of Information between 2004 and 2009, are also recorded, together with authorised honours announced by the Cabinet Office between 2008 and 2017. “Titles of nobility are indubitably fascinating but what really counts is what one achieves with one’s own skills and what one contributes to society, not what one is born to inherit,” the author comments. Indeed, he dedicates the final part to the Maltese honours system to celebrate those who distinguished themselves in different walks of life and whose contributions and achievements enriched the general well-being of their fellow countrymen. 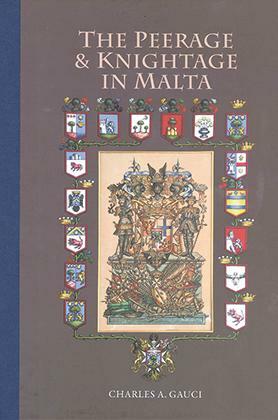 All the author’s profits from the book, which has 12 plates and over 100 illustrations, including the armorial bearings of the noble families in Malta both living and extinct, are being donated to the Association for Abandoned Animals.